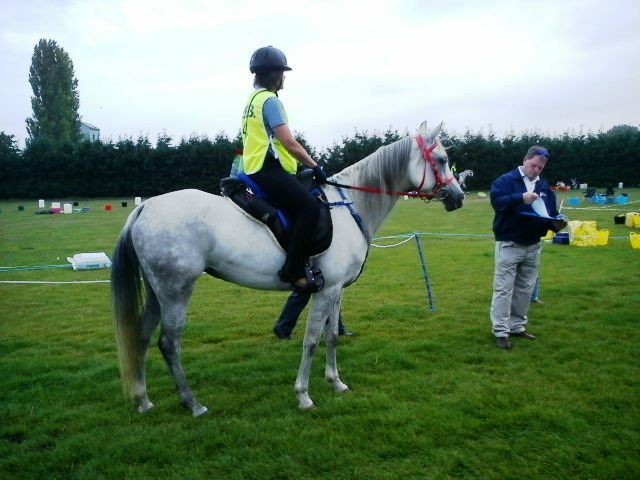 I’ve been competing in endurance rides for about 15 years and have only managed to sample endurance outside the UK once – the President’s Cup in Abu Dhabi, crewing for a British rider, whose horse was spun after 25 miles. But we got to see the rest of the race in full flow and followed some of the horses along the course in the desert – an experience I’ll never forget. We have travelled the length and breadth of the UK to compete in endurance rides but with the ever-soaring price of diesel, we are becoming more selective as to where we go and how far we’re willing to travel. The furthest we’ll travel now is a maximum of three hours to get to an event. That’s probably just down the road for a lot of riders in the USA. My favourite rides are in the North of England – they tend to be a lot hillier and more varied in terrain and generally more of a challenge. 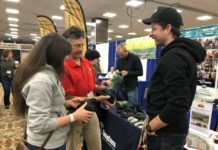 Over the years, I’ve tried a number of different boots for endurance riding and until 2010 I was undecided as to which worked best. However, in 2010 I was sponsored by the UK distributor for Easyboots – Trelawne Equine – this was an amazing opportunity to try out the Gloves and Glue-Ons throughout the season. My gelding was eight years old and at Advanced Level – in the UK this means he had completed two 65km rides and one 80km ride at a set speed. The aim for that year was to introduce him to some faster work at this level and aim for his first race rides. Upping the speed was no problem for him – he had the base of distance work behind him and at the beginning of July he completed his fastest 65km ride to date at the Wirral (fast and flat on the West Coast) in Easyboot Gloves (see picture below). 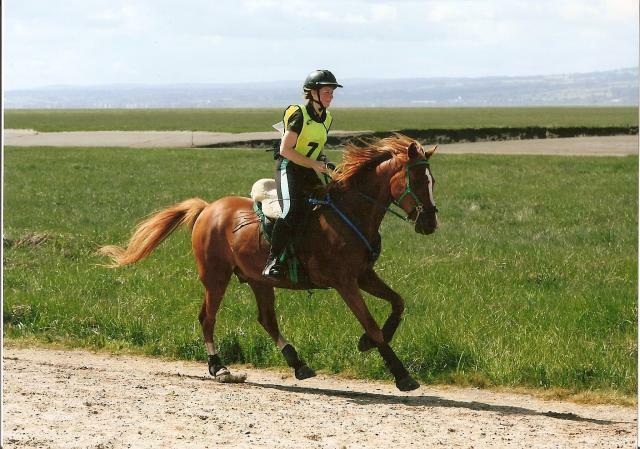 One month later, we decided to try Glue-ons for an 84km Performance Formula Competition in North Yorkshire – the results are based on a formula of HR and speed, so the faster you go and the lower your horses HR at the end and the more points you achieve. Despite being covered in glue (us not Looey), the boots stayed on really well and we came 3rd in much more experienced company. In fact, the boots were glued on so well that we left them on for a week afterwards – they then began to separate from the hoof wall and it was easier to prise them off. We weren’t worried about thrush since we’d used Equipak CS to pack the gaps between the boot and his sole/frog. We used Adhere around the cuff on the boot. The farrier at the ride predicted that they’d stay on for about two miles and once we hit the thick red clay they would all come off – fortunately he was very wrong. We had lots of interest from other riders of barefoot and shod horses – none of them had ever seen Glue-Ons in use before. He looked so good after this we entered him for his first race two weeks later. 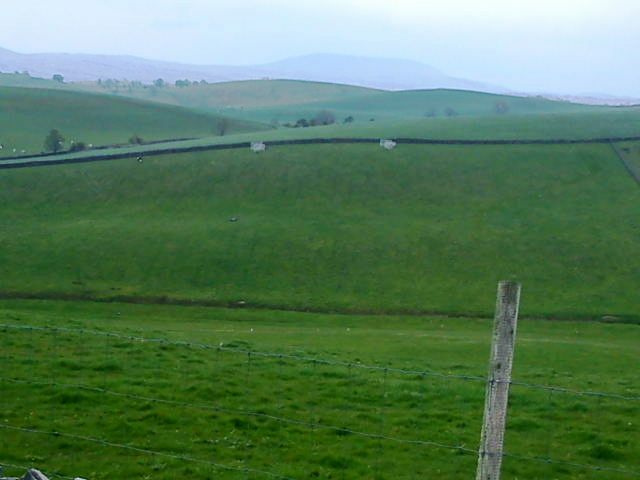 This race was to be held over the fells and ancient turf hills of Cumbria. 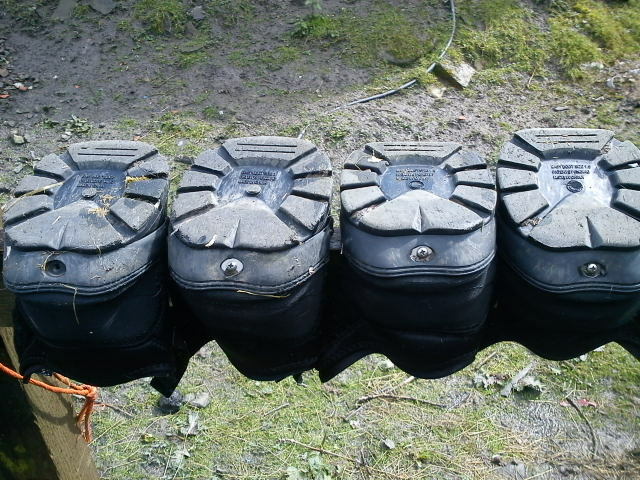 The one thing I’d learned was that the tread on the Gloves/Glue-Ons was quite slippy on short wet grass, so we decided to increase the traction on the sole by routering some extra tread – a bit rough and ready but he didn’t slip! This would hopefully give us the extra traction and be able to compete side by side on a more level playing field with the shod horses. We used Glue-Ons again and had slightly less glue make-up this time! The farrier at the ride was very interested in the Glue-Ons and said he’d be watching with interest as to how we got on. I was a nervous wreck on race-day – I hadn’t raced for a few years, since I’d started Looey from scratch four years previously and had lost my FEI horse to cancer. Loo is normally a pretty chilled character (he is 50% Bahraini which helps! ), although no-one can predict how they are going to react to a mass start. My original plan was to warm him up out of the way of the other horses – watch them set off down the field and then follow on at a distance and settle him into a nice pace. However, he was being such a good lad, I threw caution to the wind and set off with the leading group. The pace set was reasonable but started getting out of hand over some rough going into the first vetgate, so I pulled back – the leading group disappeared into the distance very quickly. The landscape had changed, the fells were now littered with slabs of limestone which is like riding on a surface covered in soap when it’s damp – so if you hit one of those at speed you’re a goner! 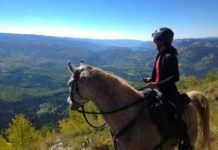 We had just got through this stretch and started to pick up speed again when I saw a group of riders and horses in front of me – someone had fallen. No-one could get hold of an organiser on their mobiles, so I rode to the next road crossing and collared a crew to send for help, they were in a 4×4, so headed out over the fells to see what they could do. Luckily, both horse and rider were fine – just badly bruised. In situations like this, whoever stops to help is given a time allowance – this makes things a little complicated when trying to work out who is now in the lead during a race. So I continued on to the vetgate knowing there were two horses in front of me and some behind, who in theory could still be ahead. Looey passed the first vetting, and made good time to the second vetgate – both lead horses were vetted out here – so I was in first place. Or was I? Two riders had retired on course, one due losing a shoe and ripping off a big chunk of hoof and the others were miles behind. It turned out that the second place rider was in first but only just if you took the time allowance into consideration. So back out onto the last loop on our own, with riders constantly heading towards us going home – Looey made a stirling effort to keep going on his own and picked up when we turned round and headed for home. We crossed the finishing line first and vetted well, but it all depended on how far behind the next rider was – she ended up beating us by two minutes. It would have been so different if we’d been riding together but was still exciting in a very different way. Again my horse and proved himself in good company and the glue-ons worked a treat. Interestingly, the winning horse was completely barefoot, so a well-deserved win. The new style gaiters have made life a lot easier, we no longer have to think of ingenious ways of wrapping his pasterns to stop rubbing from the rolled edge – I still do trim the lower edge of the new gaiter just to make sure we don’t have any pressure points. 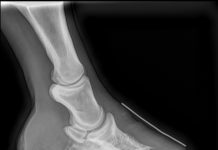 Another learning point for us in 2010 was using athletic tape round the hoof under the boot. The tape sticks to the hoof wall, heats up and then the glue seeps though and sticks to the boot. You do need to use good quality tape, we’ve found that cheaper alternatives tend to disintegrate. We always put power straps on each boot too. 2011 was a very different endurance year, we were selected to represent Team Easyboot for the first time and were now able to keep in touch with other members of the team from all over the world, pick up tips and share our experiences with other Easyboot users in the UK. The recession hit us pretty bad in the UK last year and my partner and I made a decision early on to have a year off endurance. We had two four-year old arab fillies to back and start, so that took up a lot of our time. Looey and I had dressage lessons to improve his way of going and work on his core muscles to help him recover and hold himself better. We both loved the lessons and he is a different horse this year. I also had the opportunity to crew for my filly’s dam, whom I used to own. Shannon’s owner lives in the South of England, but wanted to attempt her first race ride in Southwell which is mid-way between where we both live. I couldn’t wait to see her again. Shannon has always been barefoot, I did her first endurance ride on her in boots, but since moving to live with Janet she has never had boots on – much to the disgust of some of her mentors in the Endurance world down where she lives. Shannon looked very fit and was definitely up for the job in hand. Janet needed a bit more organising, though, and this was a big learning experience for her. She nearly blew it at the first trot up – Shannon sort of waddles like a duck if her trot isn’t moving forwards from behind – I did the next one and the rest of the trot-ups throughout the vettings and she was fine scoring A’s for action. There were only three starters – the race was open only to horses who had never raced before, we call them a Tyro. The three competitors stayed together all the way round the first loop. However, at the vetgate the temperature soared and the other riders struggled to get their horses HR’s down below 64bpm. Shannon’s recoveries are amazing and I knew we’d make up loads of time and get out in front of them. She ended up with a lead of nearly 20 minutes going onto the second loop. But, Janet let her do her own thing and said she wanted to go slower (she was actually doing a ” I can’t be bothered cos I’m on my own now” stunt!) – at the frist crew point she had nearly lost all of her lead – but after some motivation from me which consisited of “if you don’t get your act in gear, you’ll be doing the rest on your own!” – they both upped the pace and came into the last vetgate in the lead. Again, Shannon vetted very quickly and they set out on their last loop which they flew round at their fastest speed all day, finishing first on the all weather racecourse and walking calmly over the line. Shannon vetted straight away and passed with flying colours – I was so proud of them both. One thing I noticed was how many more people were now competing in hoofboots – the majority being Easyboot Gloves – and at a high level in races. More people were also trying the Glue-Ons, so there was much discussion about technique, how long are they left on for etc. So despite not competing myself, I still managed to get out and about and help and advise others on using boots. 2012: again I’ve been most fortunate and have been selected onto Team Easyboot. Again, funds are tight, we’re trying to sell our house and have lots of other projects on but due to the winter in the UK being a lot milder than the previous two years, I’ve managed to keep Looey quite fit. He did blow two massive abscesses (one hind, one fore) in early January which put him back a few weeks – but boy do those boots come in handy when they are growing out – they provide such great protection. My partner has been getting his five year-old quite fit and our little coloured cob has been getting out and about a bit more too. When the Easyboot Glove Back Country was launched we decided to get a pair and give them a go.To be honest, at first we thought they were great on Squiggle (our cob) but she has so much feather, that it was impossible to tuck it all in or let it stick out the top of the boot and so we’ve been using them on the five year-old mare’s hinds with Glove on her fronts. Again, we’ve adapted the Back Countrys slightly by extending the velcro to ensure debris doesn’t creep under the straps and stop them sticking together. Hamra moves extremely well in them and considering this is the first year she has worn boots, she doesn’t seem to realise they are there. Of course, there is always something which happens to scupper your plans – the first one was when Bond took Hamra out on a hack with his mate riding Squiggle – they were having a mad dash round the woods (no boots) and disaster struck when Hamra punctured her sole on something very sharp but blunt. So that was one down and big lesson for Bond about wearing boots for protection. Then Squiggle started coughing during a training ride – she picked up some sort of lurgy and ended up with swollen glands and snots. She had a course of treatment but has only just stopped coughing. I’ve been watching the others like a hawk especially Looey since he was entered into his first competition for 18 months! 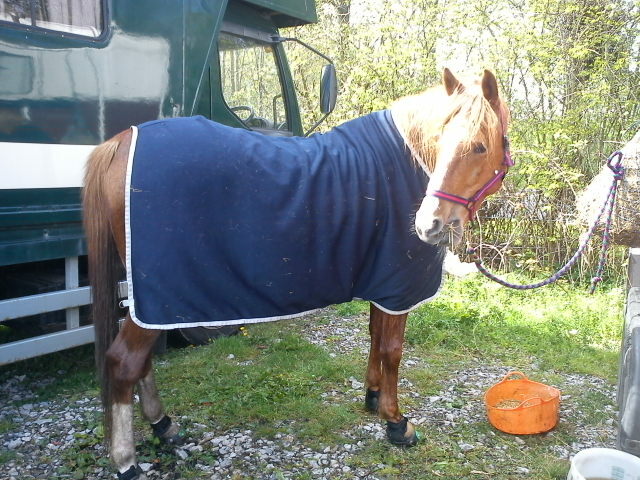 Looey has stayed clear of infection – he went and did his first ride of 40kms in April and stormed round with the fastest speed of the day – see picture below of him relaxing after the ride – his boots are still on since I’d taped his hooves and couldn’t get them off after the ride!. 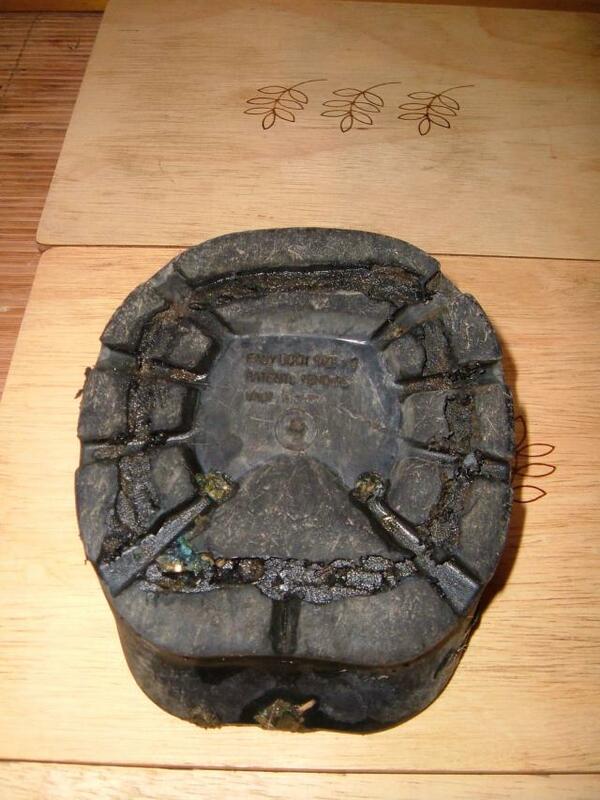 I was lucky with the boots – another lesson, remember to tighten all the screws before setting off. 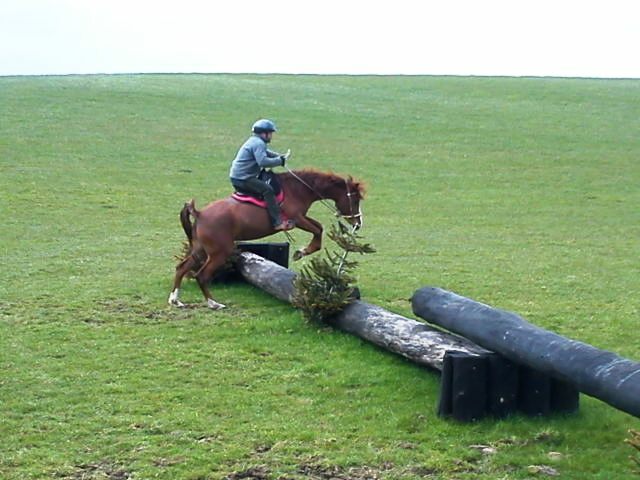 We try to vary our training and occasionally take the horses to a cross country ride where they can jump obstacles. The course is very undulating, so is great for fittening. It’s approximately eight miles long, I go round once with Looey and do the jumps (which he loves) and then go round again passing the jumps but up the speed and use it for hill training. On our last trip, Hamra even had a go at some small jumps for the first time – we do get some strange looks jumping cross country jumps in endurance gear. Our other filly has now come down with the lurgy – swollen glands, cough, snots, so she’s getting away with murder. Touch wood the rest are still fine, so we’re taking each day as it comes – if all goes well Looey will do a 65km ride soon and then be entered for races depending on what choice there is at the time. Unfortunately, a lot of rides hosting races have been cancelled in the UK this year, so choice is limited. Hopefully, I’ll be able to do some more blogs reporting on our successes in boots later in the year As yet we have to try the Goober Glueing technique, so must give it a go soon. Watch this space.